Poor Charlie Brown doesn’t get the respect he deserves. Generations have coined him as just a blockhead, but to me, he has always been so much more than just the underdog. Charlie Brown is my hero. I would pick Charlie Brown as my 12th player a million times over any MVP. He is the student I’d want in my classroom and the friend I’d want by my side every day of the week. Why? He is kind all the time, he’s principled and doesn’t just follow the crowd, he’s a problem solver and regardless of how many times he might come up short, he never, ever gives up. Which begs the question: How would Charlie Brown be in the 21st century? What would happen if Charlie Brown had a device and was on social media? Charlie Brown would be exactly the same online as he is offline. Charlie Brown is the model digital citizen. Choose kind, every time. Regardless if Charlie Brown is on the baseball field, at school or directing a play, he is kind to everyone he meets. If Charlie Brown was online he would be part of the solution and not part of the problem. If he saw something mean or humiliating, he would not retweet or repost it. Just like Charlie Brown fills other people’s buckets with kindness, he’d fill their cyber buckets too. Focus on your character. What you do when you think others are watching you is all about your reputation. What you do when you think nobody’s watching you is all about your character. Just like Charlie Brown, don’t just follow the crowd. Focus on your character. Don’t just do something because everyone is doing it. Instead, be more like Charlie Brown. Be loyal and consistent and regardless if you are on an anonymous site or you think your SnapChat will disappear, be socially responsible all the time. Solve problems, create solutions. 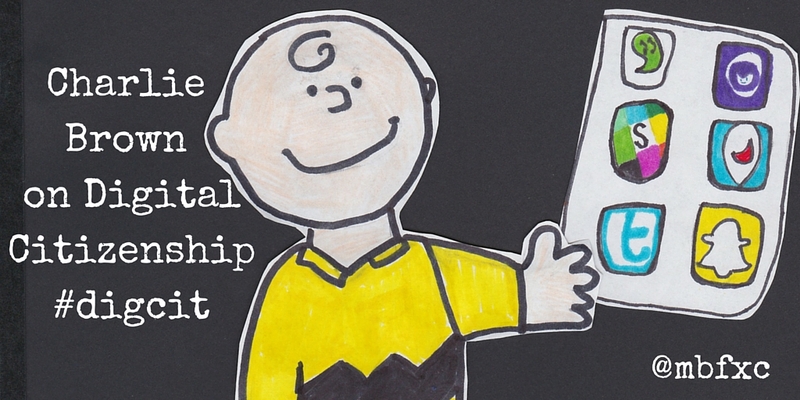 In 2016, Charlie Brown would be a MakerEd maker, a TEDxYouth speaker, and a Genius Hour genius. He’d make guest appearances on a KidPresident video because just like solving problems offline, he’d be busy connecting and collaborating with a global network to make the world better. Committed to changing his own community for the better, Charlie Brown not only reminds us all the about the true meaning of Christmas, he reminds us all what it means to be part of the human race. 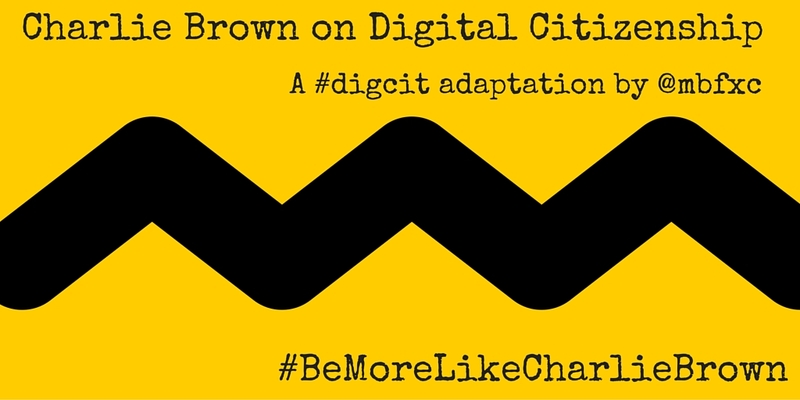 Charlie Brown with digital access would change global communities using a variety of social media tools and if I were Charlie Brown’s teacher, I’d use #BeMoreLikeCharlieBrown as our class hashtag (or maybe I’d shorten it to #BMLCB). Never, ever give up. This is Charlie Brown’s mantra. Although Lucy always moves the football the second he is about to kick it, Charlie Brown never gives up hope that he’ll get to kick the football. Every single time, he backs up and charges the football with such focus and clarity. Every time he approaches that football he believes that this is the time he’ll kick it. Charlie Brown would most definitely apply this approach to being online and he would work on that blog post or that coding assignment until he had it just right. Just like students who understand the power of social media, Charlie Brown would constantly work on his online identity. He’d build up his digital portfolio and would stand out from his peers because he understands the importance of transparency and the need to humanize the person next to you, as well as across the screen. So, the next time someone says, “Of all the Charlie Browns in the world, you’re the Charlie Browniest,” know that you just received the highest digital citizenship stamp of approval you could ever possibly receive. Now go out there and be more like Charlie Brown. This week at EdcampCT, I had an opportunity to model the app Periscope with my colleague Judy Arzt. Periscope helps you explore the world through someone else’s eyes (and device). Judy and I decided to model the app during our session on social media in education. We had our live audience in Connecticut, as well as a global audience via Periscope. When planning our Periscope, I decided to bring some of my Elephant and Piggie books by Mo Willems. I thought it was the perfect analogy for social media in our schools today. We all know the Piggie in our school. Piggie is the educator who is already on board and excited. 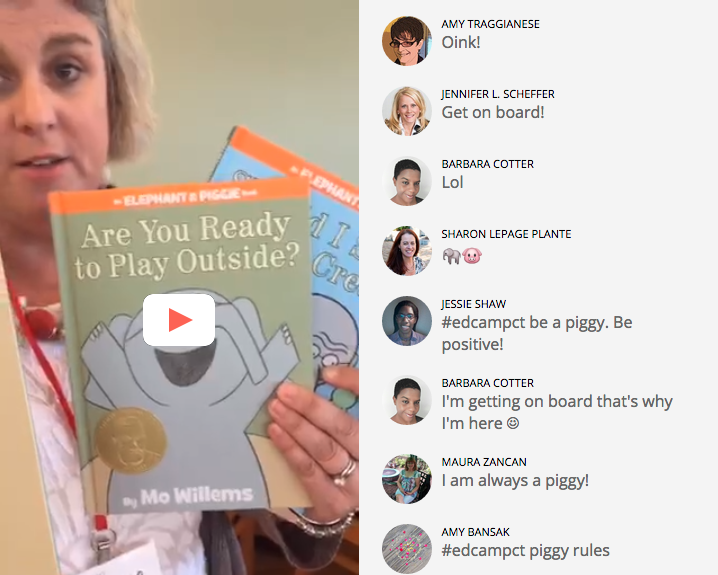 Piggie in the educational world is definitely a connected educator (and an Edcamp groupie, for sure). Unfortunately, we all know Gerald the Elephant in our schools too. Gerald is fearful, full of gloom and doom and waiting for the other shoe to drop. Gerald is afraid of social media and is the educator who is not on board and is perhaps rolling their eyes as Piggie shares her excitement over all the awesome things she learned at EdcampCT. The good news is that Piggie, by the end of the story is always able to win Gerald over. It is my hope, that as we start this new school year, we are just like Piggie and win over all the Geralds in our schools and communities. Piggie: [Excitement in voice] We are going 1:1! Elephant: [Panic in voice] WE ARE GOING 1:1?!? Piggie: Yes Gerald, we are going 1:1! We are bringing social media into every classroom! Elephant: [Confusion in voice] Piggie, what is 1:1? Piggie: [Excitement in voice] 1:1 means that everyone has access! Everyone will be able to connect and collaborate with the world. Elephant: [Panic in voice] The world?!? How will we keep all of our students safe if we don’t have blocks and bans in place? Piggie: We’ll embed digital citizenship into the curriculum! Elephant: [Confusion in voice] What’s digital citizenship? Piggie: Digital citizenship helps students be safe, aware, global and socially responsible both on and offline. Piggie shows Gerald her device. Elephant: [Concern in voice] Piggie, won’t the students be distracted with all these devices? How will they pay attention in school? I don’t think the teachers will like this at all. Piggie: Gerald, social media is just another tool. It will help the teachers break down classroom walls and bring the world inside the classroom. Elephant: [Panic in voice] They are going to break down the school walls? That is vandalism. This is not a good idea – not a good idea at all Piggie. Piggie: Gerald, the school walls will not literally be knocked down. Piggie: No, they won’t. The devices like this one here [motions to the device in her hand] will help the teachers and students connect and collaborate with other classrooms around the world. Elephant: [Confusion in voice] What will this look like? 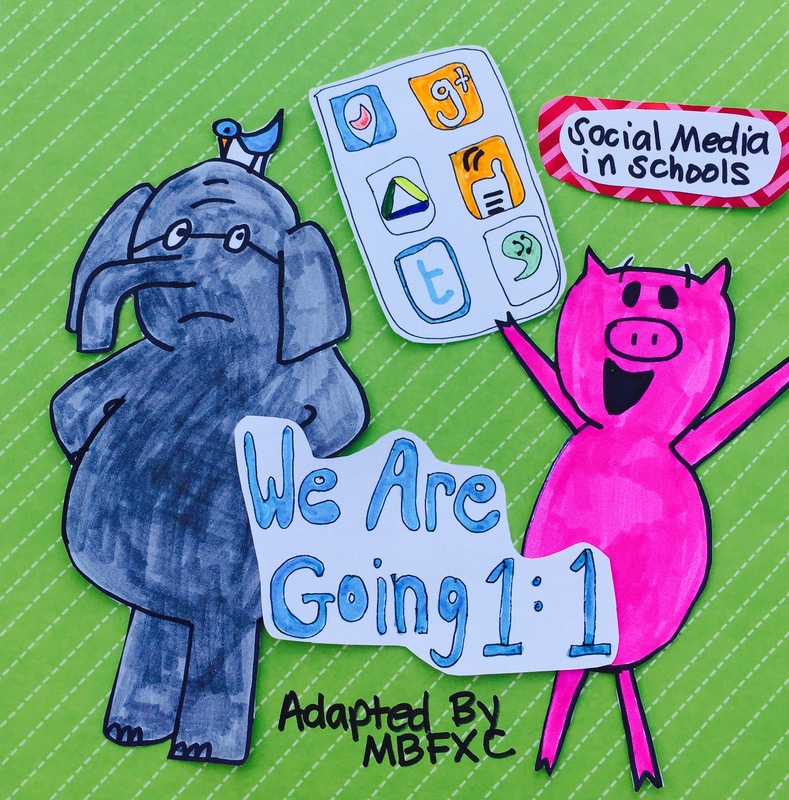 Piggie: [Excitement in voice] Teachers and students will be able to use social media tools like Periscope, Google, Skype, Blab, Twitter and lots of other apps to learn together. Elephant: How will these social media tools help them learn together? Piggie: [Excitement in voice] The sky is the limit, Gerald. They can blog and get comments from other students and classrooms around the world, participate in Genius Hour, learn through Makerspaces and 3-D printers, participate in global projects like Mystery Skype, Global Read Aloud, Connected Educator Month, Dot Day, Hour of Code, and so much more. Elephant: [Excitement in voice] Piggie, this is incredible! All these social media tools will provide ample opportunities for all students! Elephant & Piggie: Yay! We are going 1:1! We are bringing social media into every classroom! Elephant: Piggie, I was wondering, how schools will provide specific professional development on digital citizenship? Piggie: Administrators, teachers, school counselors, library media specialists, students and parents will buy blocks of tickets to attend the Digital Citizenship Summit on October 3rd in Connecticut! Elephant: What will they learn at the all day Digital Citizenship Summit? Piggie: A lot, Gerald! The #digcitsummit is not to be missed! The all day event has national experts speaking about how to embed empathy and kindness early and often, digital etiquette, cyber ethics and law, issues surrounding privacy, how to parent in the digital age, digital literacy, copyright issues, resources to combat cyberbullying and promote a positive school climate, social media optimization for students, empowering educators by creating 1:1 learning environments, technology addiction and so much more. Elephant: Where can I find more information and buy tickets? Piggie: Just go to http://digcitsummit.com/ and follow the blog for updates and you can buy your tickets here: http://digcitsummit.com/registration/ or call the ticket office at 860.231.5555. Gerald, also follow @Digcit1 on Twitter for updates too. Elephant: I can’t wait to go to the Digital Citizenship Summit to learn all about digital citizenship! Hope to see you on 10/3 for another great day of learning at the #digcitsummit! 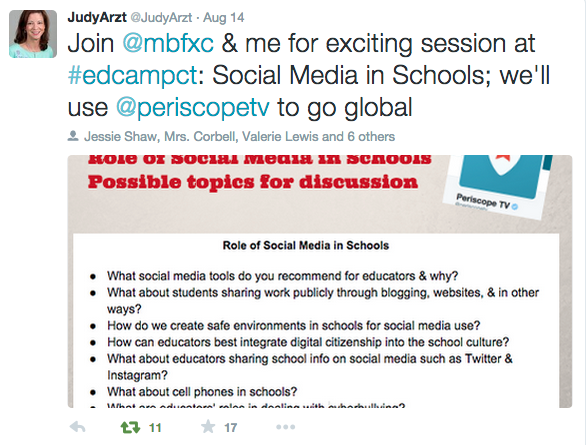 *For more information on our #EdcampCT session on Periscope, check out this post by Judy Arzt: School Media in Schools, Why Not? *Watch our Periscope session, Role of Social Media in Schools on Katch. You don’t know what goes on in anyone’s life but your own. And when you mess with one part of a person’s life, you’re not messing with just that part. Unfortunately, you can’t be that precise and selective. When you mess with one part of a person’s life, you’re messing with their entire life. Everything…affects everything. Props to Jay Asher for writing such a powerful story about the consequences of our actions in Thirteen Reasons Why. It is required reading for one of my undergraduate technology courses next semester and I strongly suggest that you add it to your must-read list too. What are your you engage, model and teach empathy and perspective early and often in our classrooms? I just finished up a great PD day with some amazing teachers through a Mark Twain Summer Grant. We were focusing on Twitter and how a hashtag can help you narrow your search. 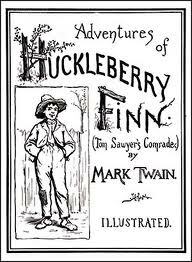 One of the teachers asked me to search #huckfinn. I had expected to find resources posted by teachers, but what we found were adolescents tweeting about their summer reading and it wasn’t very positive. On my drive home, I was thinking about how sad their responses (and choice of twitter handles) had made me and how surprised I was to witness such negative online behavior when all I’ve ever experienced on Twitter has been so positive and rewarding. It is a great reminder that our students need us. No matter what age or subject you teach, it is our responsibility to be teaching and modeling digital citizenship. We need to engage our students in this discussion – they need us!